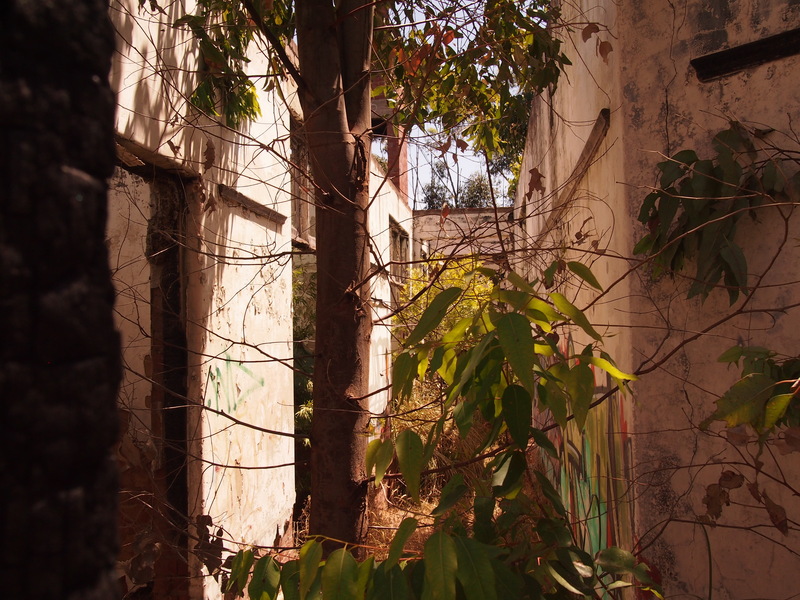 The crumbling buildings of Larundel have had many uses in their life, including as housing commission and an women's air force training depot. 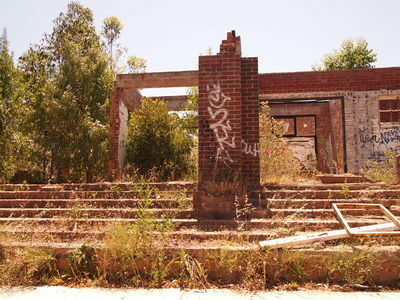 However, Larundel is best known for being a former mental asylum. For almost fifteen years the corridors have been empty, save for the adventuring of urban explorers. Larundel is a former psychiatric hospital which has fallen into a state of disrepair. 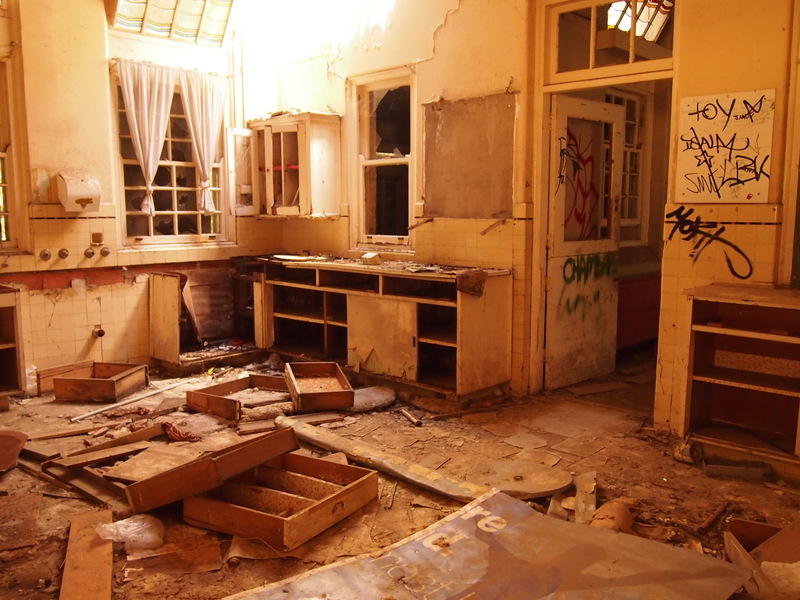 The site had been left idle since the closure of the psychiatric hospital in 1999. Now undergoing redevelopment into a residential compound, the derelict buildings shown here are being replaced with neat town houses. When I visited in 2013, the only sign of construction having taken place is the neat new driveway and parking spots, with the buildings left untouched; now, new life has been breathed into the former dilapidated site with building of the new residential compound underway. 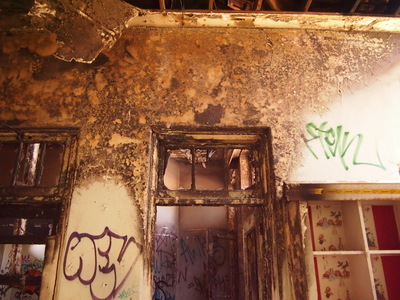 The natural deterioration of the buildings has been hastened by vandalism. The interiors are intricately decorated with graffiti tags, on almost every surface. Anything capable of being destroyed has been, with electrical cables having been ripped out of the walls and rooms that look like they may have once been kitchens completely trashed. Larundel has been trashed in every way possible. Jim Beam seems to be the beverage of choice for explorers, with cans littered around the more accessible areas. Some rooms have flies swirling around and dirty rags on the floor- makes you wonder what's in there. Despite the state of disrepair, the structure seemed stable enough to walk around. Even the second storey floors did not feel like they were going to collapse anytime soon. 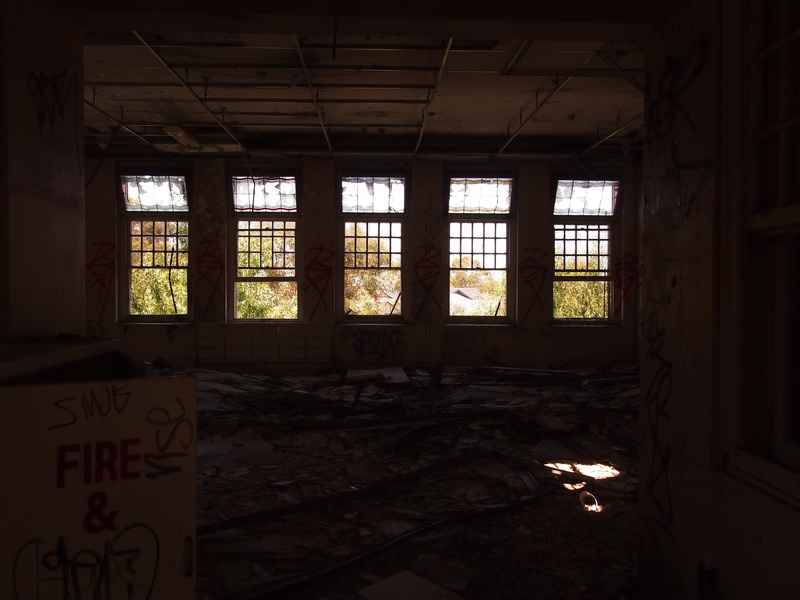 Only one of the buildings, with a gaping hole in the floor, did not seem safe to enter. With parts of the hole appearing cleanly cut, perhaps it is more of a deterrant than a sign that the floor is rotting. The destroyed floor of one of the Larundel buildings. 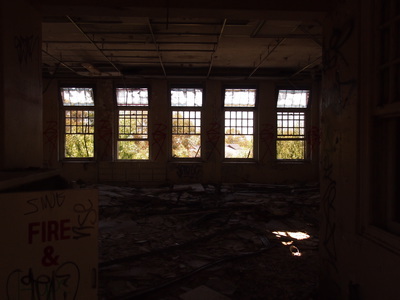 The buildings are lit by natural light from the broken windows, but it's still dark enough inside to be creepy. It may seem pleasantly bright in the photos, but that's a reflection of my inability to use the right camera settings rather than how it actually looked. It really was scary, promise. One of the smaller buildings has had its roof removed. Being so open and full of light, it is not scary like the other buildings. The thriving weeds growing in every possible crack of the outdoor building make exploration difficult. The corridor is rendered inaccessible by trees and towering grass. Trees blocking the main corridor of Larundel's outdoor building. Larundel is a favourite among ghost hunters, with the former asylum said to be haunted. While the state of the place was certainly creepy, I can report no paranormal happenings other than the appearance of a stray black cat. There didn't seem to be any ghosts, but I still wouldn't want to be here at night. 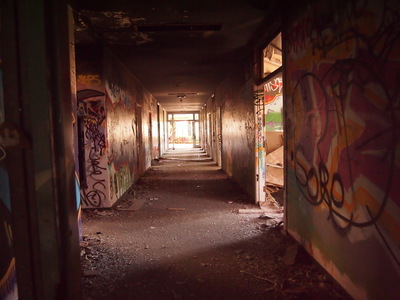 If you believe some of the stories about the place, visiting seems like a real-life version of horror movie Death Tunnel. 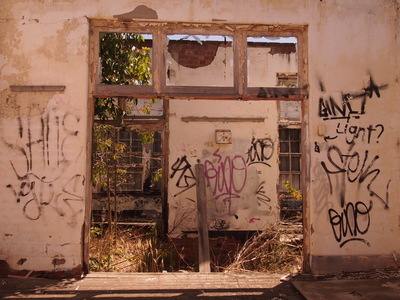 In truth, Larundel is said to have been a lovingly managed psychiatric hospital rather than a state-owned house of horrors. 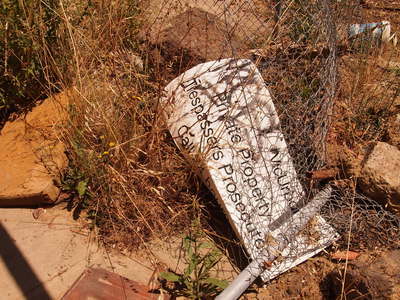 Note that trespassing is illegal, and there is not much to see with the construction of the new residential development. Apparently, you're not meant to enter Larundel. Why? To see a piece of history before it is redeveloped. I can't even imagine why this is interesting to anyone, at the very least your term "mental assylum" is offensive and very outdated. It was an institution and very rarely was any institution run "lovingly" in this country. PS And of course this is interesting to people! Great idea for a piece and fantastic photos. Very interesting article! Great photos too. How trite the latter description of yourself, the subject duly warrants the attention of one more concerned with life and the suffering of others. "Enter at Your Own Risk" can equally apply to those interned there and those seeking adventure, what a horror it was to be locked up there. Yes, just 15 years since the last patient was contained within those. I wish the walls could talk to reveal the atrocities patients endured, often at the hands of the nursing staff and injustices from other patients. Perhaps these atrocities and conditionswould have provided your article with more credence, rather than highlighting the spookiness of the 'now' Larundel. Try to put your mind to how recent it is since ppeople were interned at Larundel. I prefer to use the term Psychiatric Hospital rather than Mental Asylum, a 19th.century expression. While all efforts are seen to be done to eradicate the stigma around mental illness you have chosen to grab onto an archaic title.Did you consider how demeaning "mental asylum" could be to larundel's former "inmates"
The kitchen you descrisbed was where our food was dispensed, of meagre helpings while lbeing mostly of indigestible quality. What is in there you ask. 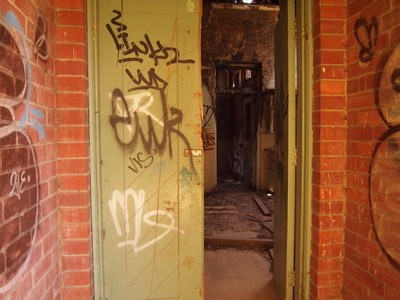 Many dark and horrific stories are within those walls, indelible memories for the "inmates". Larundel was a really scary, formidable place for the "inmates", I am sorry that the buildings now supply mystery and adventure to those who have no comprehension of what it was like to be locked up in Larundel. I don't find it surprising that Larundel is now a favourite amongst ghost hunters. As an "inmate" in the 1980's, I can imagine many spirits abound there, of those interned there under atrocious conditions, Larundel was a living hell. As an"inmate" I can onlly concur that it was a creepy place and was a real life version of a horror movie. In truth you say, Larundel was a lovingly managed psychiatric hospital, nothing could be further than the truth. I would suggest that you research your subject on a more caring and empathic level, having regard for those of us who expererienced first hand the ghastliness of 'The Living Larundel'. I hope lthis prompts you to give regard to the unheard voices of Larundel. I spent a few months here in the early 90s, after suffering a traumatic event when I was a very young adult. It was run like a prison. Patients had to be up at the crack of dawn in the Melbourne winter and were herded into communal showers. Heating was very poor. Then we were given medication which made us perennially sleepy and lethargic but weren't allowed to go to sleep until after 9 pm. It was very difficult to survive here. Often there were predatory patients, eg there was one older gay guy who would try and molest me. Nurses wouldn't believe my complaints and there was a strong "us versus them" mentality between staff and patients. I'm so glad I was certified as normal within a few months. Had I stayed there, I would have likely gone insane. More photos of the asylum, including most at night! These were from a shoot I did with some friends, turned out really cool! My Grandmother was placed in this home unsure if she had a Break down or had Dementia would like to find out her records if any one could tell me on here. I can remember my mum saying she went to see her mum she was sitting on a chair crying event time she went to see her. Visits stopped so she died without anyone there for her. Hope they re-open it one day. 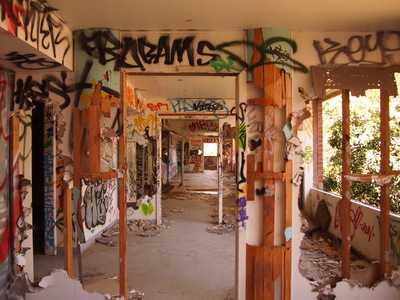 It's a disgrace that these buildings have been left to be vandalized like this, shame on whoever is responsible for them. The buildings at Janiefield, also in Bundoora have been restored and are now part of a new housing development. Time for Larundel to also be treated with the respect it deserves. Hey, I did research on this place last year (both for an assignment and for a novel I was writing). The building that has no roof was actually destroyed by a vandal/squatter lit fire and that's how it lost it's roof. The remaining buildings are covered by the Victorian heritage listing (see here:http://vhd.heritage.vic.gov.au/#detail_places;66812) so they will NOT be destroyed. Also, there are several buildings that are already restored and converted into apartments that are currently for sale via the Polaris group. i would say that u are really a brave heart to even enter such a place. very interesting nd nice pics. Good article. I've always been fascinated by Larundel. Great article! Most interesting I've read on here for awhile :) Being. Photographer, I REALLY want to go there! Natasha you have brought this to our attention and it makes us reflect on an institution that existed so recently. We will all reflect differently. Very sad for people that were and that treatment was so punitive there but your last reply was a good explanation of how and why you featured it. Thank you I found it very interesting. Larundel was, in it's time, at the forefront of neurophyschiatry and offerred the latest in treatment for patients; many of whom would have otherwise found themselves incarcerated in prisons. Along with other large institutions offering services for people with mental health problems, physical and/or mental disabilities, it was closed with the hope that we are living in a kinder, more accepting society. Nowadays, acute psychiatric care is provided in small wards at larger public hospitals. The majority of people with mental health issues are largely ignored by our health system and their struggling families are left to fend for their loved ones and themselves. Working in a Court, I've seen clients who have been charged & bought before the court for trespass through entering this property. Security does patrol this site & police do charge offenders. Enter at your own risk. Sadly, this article is interesting for those who only know the name and where to find such a sad place. I remember growing up you would hear people speak the word Larundal or The Mental Asylum and when I was young, hearing those words scared the living daylights out of me to the fact, it seemed Prison might have been a better option if there was a choice. Both sounded very scary. From listening to adults speaking about the institution it seemed like no one would be "let out". Back then the words used were bandied around with no political correctness like today. None of the words used were offensive that's what was said, but had the reaction of shock. The stigma and judgement was similar to those in prison. One just wouldn't have really known because mostly it was spread "by heresay" and for me I just as a kid listened and none I know of never entered through the gates. So there was always the thought questions.....where is the place? What do they do there and so on. A very sad place. I'm glad to hear the building is being renovated to breathe new life into it for better purposes. Lou, Desy and dcoop,I'm so sorry to hear about your plight I couldn't imagine living there for a day let alone for weeks, months or years. Lou, thank you for your input to share your side of living there. So sad and I'm sure quite traumatic too. Have you thought of writing a book about your stay there? Your experiences and thoughts about life there as an Historic mark/event for others wanting to know about Larundal for further Family History Researchers? Plus adding how you have coped since because I feel your story to be quite inspiring. You write very well, Lou. Natasha thanks for the heads up for better or worse. 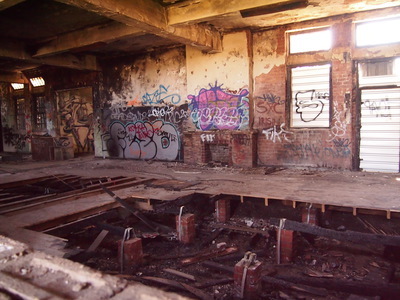 The first time I ever decided to explore an abandoned building was this place... after 10 minutes of being there, my boyfriend fell through missing floorboards and I had to take him to get stitches and a tetanus shot! We've been to heaps of other places since with no issues. I'd recommend anyone going to take a big torch even in the day! If this site is closed to trespassers did you get onsite illegally? The state of vandalism and graffiti on this site is disgraceful. Those who did this should be ashamed of themselves. I know someone who was there at one stage I would love to go have a look. Thanks great photos too. 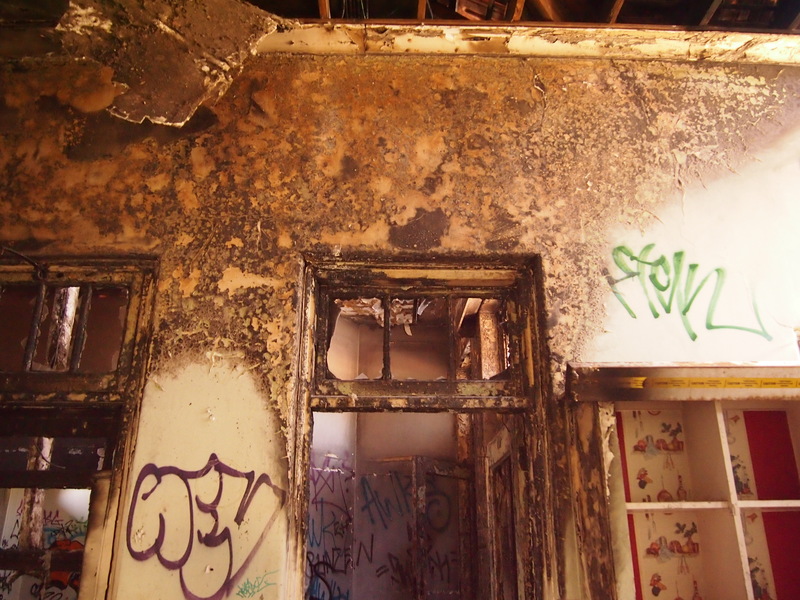 what happens to the heritage listing when a property is damaged as badly as this? The reason this place is patrolled is not because of risk of vandalism... its the fact the building structure is unsafe and for the publics health. There is asbestos everywhere! The whole place is covered in it. That may or maybe the reason its taking so long to develope the site. Because they have to be so careful pulling it down. Councils bury asbestos in landfill because its so risky to breakdown and its very expensive to remove. Cant risk the dust blowing around either especially if there is houses near by or within distance of harming people. So if u dont want to die of asbestos inhalation dont go anywhere near this place for ur own health. This is very serious! There should be signs warning people of the risks there. Visited there in 2009 at night. Patrolled by security and full of asbestos. Stay clear if you can. I worked at Larundel Psychiatric Hospital during the 1980's and early 90's and never once heard it referred to as a Mental Asylum. 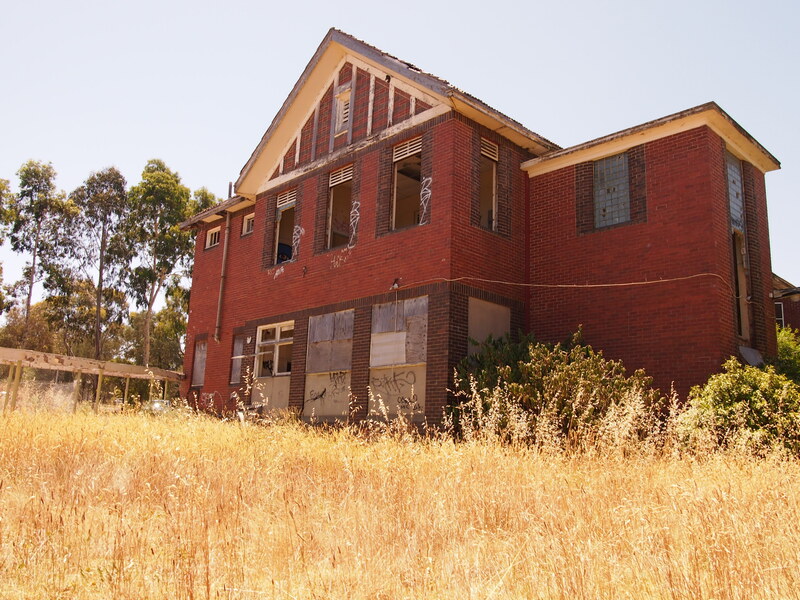 It was a hospital for those in need of psychiatric care so of course it wasn't a holiday camp but it also wasn't the nightmare of horrors some have made it out to be, certainly not in the eight years i was there. Unfortunately Jeff Kennett decided there was no money to be made in this area so he cut funding and eventually closed Larundel and other facilities like it... now with the passing of time, neglect and vandalism, we are sadly left with just a few abandoned buildings and peoples imaginations fueled by stories they've heard from a friend of a friends brother that had an uncle who worked there. As i said it wasn't a holiday camp it was a psychiatric hospital. How could i access this site? Is there anyone who could give permission to enter! I was only 15 when I was committed to Larundel. I spent almost 2 months living in a place l never knew existed at a tender age. I had my 16th birthday behind those walls. I'm not even 60 yet. I can forget that crazy place. It was like hell sometimes but I survived. I was not insane and never was, just a product of a system that failed to see that. I'm lucky l left sane. It was corrupt to say the least in some aspects. I walked away happily telling myself that I wasn't going to go nuts for any person.